The rhythms and routines that form at sea are dictated more by our daily tasks than by a weekly pattern, as often is the case on land. Monday, Wednesday, Saturday…these words do not have meaning while living on boat, whereas meal times, science meetings, and sunsets do. The balance between monotony and routine is delicate; a routine gives me some purpose and is the framework to build a productive day around, but too much of the same and you can lose the spark needed to push forward with the science, the brainstorming, the attention to detail. 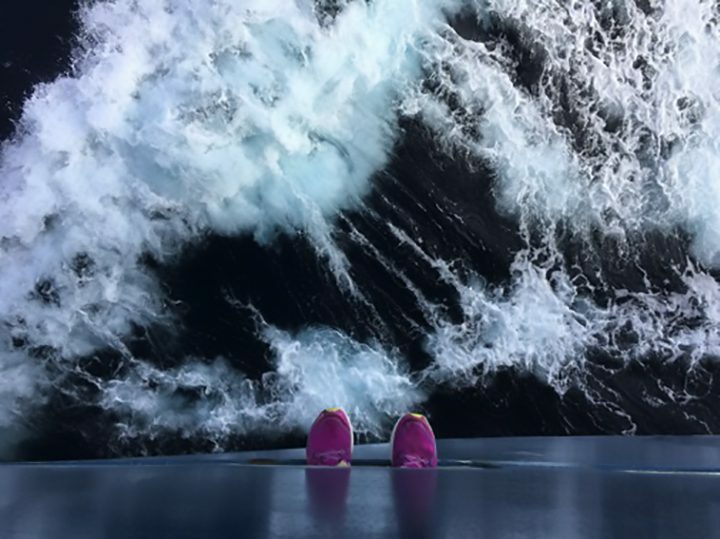 We are all “stuck” on this boat, with nowhere to go – but to stand on deck (or on the bridge, four levels above the main deck and where the boat is driven from) and watch the power of the sea all around – it never gets old, for me. Sure, I have my reasons for wanting to be back on shore, as we all do, but to stare at the ocean and sky all around…it makes me feel small and humbled and grateful to exist on this planet. Deep, I know. Looking down at the ocean from the deck of the R/V Atlantis. The past few weeks have brought challenges to our work in the form of weather and equipment failures, and yet people keep smiling, laughing, running new experiments, and generally embracing the situation. The work we do is real and raw and unpredictable…and for all the prior research that has been conducted to study this part of the world ocean, we still have so much to learn. The beauty of research is that we don’t know what we don’t know. Being at sea is poignant reminder that studying the ocean and atmosphere is a blend of organized and calculated experiments with creative openmindedness. The data collected from this expedition, and in combination with the results from the first three NAAMES cruises, will allow us to add our piece to the scientific puzzle and push the bounds of our knowledge forward by another increment. Views of the Atlantic Ocean from the R/V Atlantis. I try to make a conscious effort to take pictures of something aside from the ocean view, which without a doubt is the most photogenic option around…but the reality is that most of our hours are spent in the labs, futzing around with instruments, filtering water, or staring at screens. 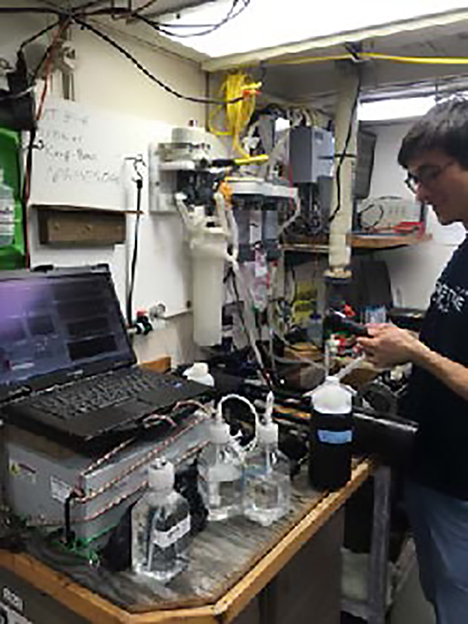 For example, once a day we clean and calibrate the suite of instruments that we have installed in a “flow-through” set-up, which means that they run continuously and collect data around the clock from seawater that is continuously pumped from the surface waters beneath the boat. See the pic below for the usual daily instrument-cleaning scene. Nils performing the daily instrument cleaning. This entry was posted on Wednesday, May 16th, 2018 at 12:46 am and is filed under NAAMES (North Atlantic Aerosols and Marine Ecosystems Study). You can follow any responses to this entry through the RSS 2.0 feed. You can skip to the end and leave a response. Pinging is currently not allowed.